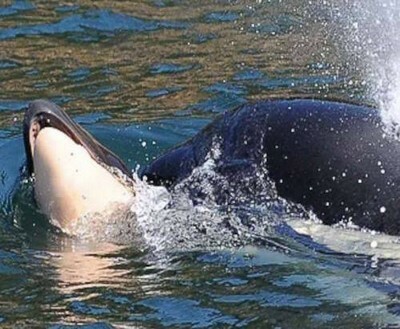 CBC reports that “the story of the southern resident J-pod orcas, and the mother mourning her dead calf, has drawn attention from around the world,” prompting the Twitter campaign focused on Trudeau. “Let’s jam their social media like tankers jam whale sonar,” Coast Protectors urges in its call to action. In the U.S., Greenpeace is out with a similar appeal, calling on Gov. Jay Inslee to enact a moratorium on tanker traffic through Washington State waters. “If it goes ahead, the Trans Mountain Pipeline expansion could send 400 new tar sands oil tankers through these orcas’ habitat every year,” Greenpeace notes. While Tahlequah grieves her calf’s death, CBC notes that another calf, four-year-old J50, is starving, showing signs of malnourishment and lethargy. University of Washington conservation biologist Deborah Giles said J50 has only grown to the size of a one-year-old, and its condition has deteriorated through the summer. “I’ve personally never seen a whale that thin and still swimming around,” Giles told The Star Vancouver. In response, Fisheries and Oceans Canada (DFO) and the U.S. National Oceanic and Atmospheric Administration (NOAA) “are considering a plan that would involve feeding the underweight killer whale chinook salmon with medication in it—a strategy the U.S. department believes hasn’t been used before,” CBC reports. “We have no idea at this point if an attempt to provide food, or medication in the form of food, would be successful,” said NOAA public affairs officer Michael Milstein. Milstein also stressed that “a lack of food is only one of the reasons southern resident whales are struggling,” CBC states. “It’s insane to be building this pipeline,” added Living Ocean Society Executive Director Karen Wristen, in an interview with Yale Environment 360. “There’s too much noise already in critical habitat, and adding 800 tanker trips a year (400 into port and 400 out) to existing levels of noise is not going to be possible” without further endangering the Southern Resident pod. “Heartbreak for Tahlequah is an appropriate starting point,” notes oceans specialist Susan Casey, in a New York Times opinion piece that points to scarce, contaminated food as the most immediate threat the orcas face. “In a way, it’s the easy part. What’s harder is turning our shared sense of grief for this mother into an impetus to solve the problems plaguing the dwindling southern resident orca population. “If we aren’t willing to turn our empathy into action, then one day in the near future we will explain to our children and grandchildren how incredible the orcas were, and how bad we felt about their fate.